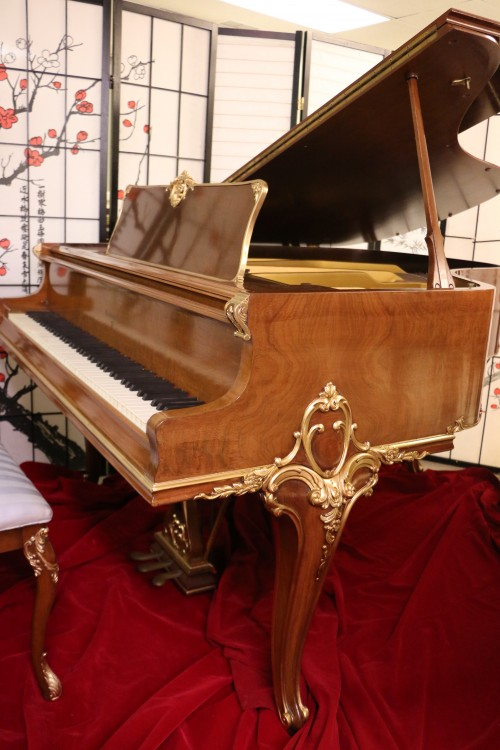 Knabe Piano, decorative art case, hand carved Queen Anne Legs, dense, pretty walnut grain, action just regulated, completely refinished about 10 years ago made during the heyday of piano manufacturing in this country 1931. Excellent condition inside and out. Matching bench. Rich, classic Knabe tone. Knabe pianos one of the best piano manufacturers in this country. Questions? Call Sonny Direct 631 475-8046. Free LI/NYC delivery. All else continental USA only $475. Warranty. Video Tour Coming Soon! See Our Other Video Tours! We just decided to put new hammers, shanks and knuckles (thus the slight price increase) on this gorgeous Knabe Baby Grand, pretty mahogany satin finish. Just refinished and refurbished. New key tops, action just regulated, great Knabe tone and action response. Made in the heyday of piano manufacturing in this country-the 1920’s. Warranty. Free LI/NYC delivery. All else continental USA only $475. for delivery and set up. Questions? Speak with Sonny direct at 631 475-8046. Knabe Grand Piano 5’8″ 1936, Rebuilt and Refinished about 15 years ago, new hammers, dampers, strings, pins, pin block, felts, key tops, bushings. Great sublime Knabe bell like sound and action response, beautiful mahogany grain, satin finish. Piano played lightly since rebuild. Warranty & Free delivery and set up on Long Island and NYC all else continental USA only $475.for same. Questions? Speak to Sonny direct at 631475-8046.